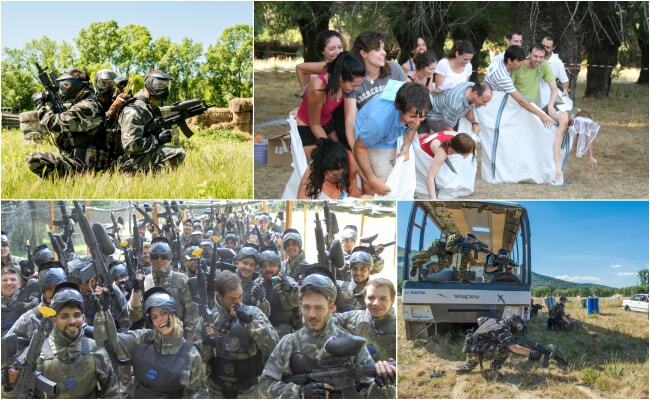 At Gran Paintball Madrid we offer the funniest Multiadventure activities in Madrid! If you want to enjoy a unique experience, in the middle of nature, and practicing a sport loaded with super fun adrenaline and by teams, do not hesitate to call us or send us a WhatsApp to +34 636475305. Paintball is presented as one of the best multi-adventure activities in Madrid, as it combines the emotion of a sport in nature by teams, with the challenge of winning the opposite team in different tests by objectives and in a multitude of scenarios. This is why more and more clients choose us to enjoy unforgettable days, doing the best activities for bachelor or bachelorette parties, weekend getaways, or days of teamwork or team building, all without stopping to have fun and to pump adrenaline in our circuits. Paintball for adults, with the best equipment you can find in any paintball field in Spain: you will play with high quality gear: Bravo One Elite markers (replicas of the famous M-16s), with camouflage suits, gloves, vests, belts and camouflage masks, as well as the latest novelty in the world of Paintball – the remote cable to connect the bottle of compressed air (located on the belt) with the gun. Simply spectacular! Paintball for children with the same equipment as adults, but with weapons specifically designed for children between 8 and 13 years. Gymkanas multiadventure for adults in which you will not stop laughing. Gymkanas hilarious for boys and girls (both in winter and summer). Team building, events and group dynamics for companies..
Barbecue and / or open bar in our beautiful environment, protected by its landscape and ecological value. So now you know, adventure in Madrid is Gran Paintball Madrid! Gran Paintball Madrid has a space of 150,000 square meters in the middle of nature where you will enjoy the best adventure sport. 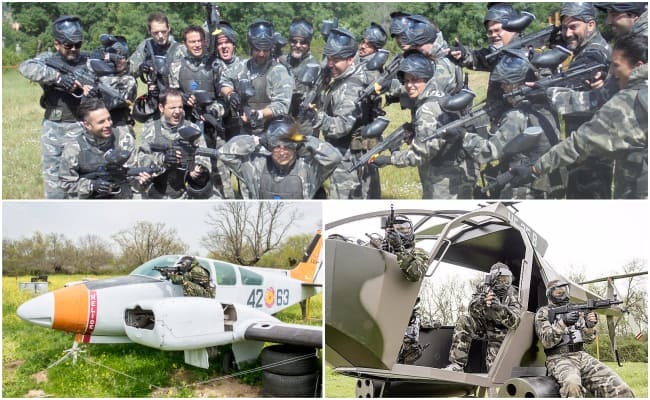 For Paintball, our park has 9 themed scenarios where you will play and pump adrenaline between our plane, helicopter, bus, military vehicles, tank, boats, fort, towers, forests and a long etcetera that will make your experience unforgettable, whether it is a bachelor party, a multi-adventure birthday for children, or a Team building event for your company. We carry out the gymkanas in an unbeatable frame for the views, in a spacious terrain of the mountains of Madrid where we carry out all type of tests for teams in which we guarantee you the laughs and the connection between participants, as well as a lot of anecdotes to tell later. Gran Paintball Madrid is ideal for multi-adventure sports in the mountains of Madrid. We are very fortunate to have worked with dozens and dozens of the most important companies in the country, preparing team building days for their employees and getting in each case to enjoy a great day of adventure and emotions, achieving greater group cohesion and strengthening teamwork. Our games and activities are perfect for this type of day as we make workers enjoy a different day full of emotions and adrenaline, which is what strengthens the bonds between employees. That’s why companies repeat with us year after year, something we’re really proud of. We are located before reaching San Lorenzo de El Escorial, with a super easy access, by the A-6 (4-lane motorway) and with the possibility of coming by public transport, as the bus 664 that leaves Moncloa drops you off exactly at the entrance to the Paintball in 35 minutes. For all this, if you want to do multi-adventure sports near Madrid, Great Paintball Madrid is your park! In Gran Paintball Madrid we stand out for having invented completely new, original, and above all fun games, which are not played in any other Paintball field in Madrid. To the traditional games that are played in all the fields, we add new challenges so that every time you come to play with us your experience is different. In these games we give you some documents with the objective, the score of the game, and the maximum time you have to carry out the missions. The scores will establish a winning team at the end of the game, and the best Paintball player of the day. Take the barracks in the shortest possible time. Take your captain to the secret meeting. Do the Paintball, not the war. In addition our company of Multiaventura in Madrid has designed a new modality of Paintball that will revolutionize this sport as we currently understand it. We will gladly inform you about this new way of game in our fields of Paintball and Multiaventura in Madrid. Our only objective is that you really enjoy a different and unforgettable day, practicing a sport that will charge you with adrenaline, and in a completely natural environment. We guarantee that our service towards you will be exquisite, and what we want is for your experience to be so fun that you are eager to come back. For all this, our team strives every day to improve existing games, and create new ones that will surprise you. Come try us, come to Gran Paintball Madrid!